Filipinos love pets, especially dogs, we even have one at home named Skippy. A cute 3 year old Dachshund. But when it come to food, we normally feed them the same food we eat, admit it -- the typical ulam plus rice combo. Here is where the ultimate question comes in, are you feeding your dog the right kind of food? They might be man's best friends, but dogs and humans have different nutritional needs. A canine diet requires more nutrients than us. So while our fur babies might seem happy to clean up a bowl of last night’s dinner, it might not meet his or her needs. This is where Pedigree comes in! According to Pedigree, there are 5 signs of good health for dogs. (1) Shiny Coat (2) Stronger Teeth (3) Firm Stool (4) Stronger Muscles (5) Cheerful Disposition. But what do you do when your pet lacks some of these good health signs? You might want to feed them right with food that can supply them with all the nutrients they need. Luckily, Pedigree Philippines is giving you a chance to have your fur babies a try at their products at no cost! How Can I Get My FREE Pedigree Samples for My Pet? Getting your sample is easy as pie, just head to Pedigree Philippines' Sampling Website and click Register Now. From there, you'll be asked for your mobile number, full name, mailing address, and a few details about your dog like age, breed, gender, and what kind of food are you currently feeding so they can send the right set of samples for your fur babies. After that, just wait for your goodies to be delivered to your registered mailing address within 14 days from date of registration. A reminder that delivery scope of this promo is limited to Metro Manila only. 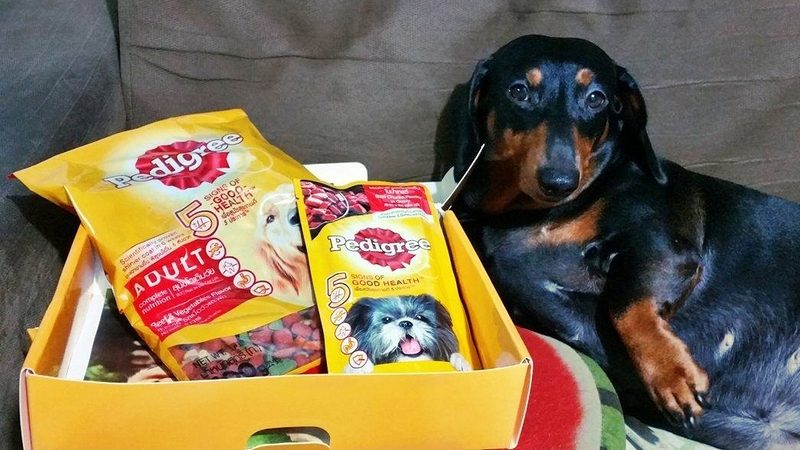 Here is my fur baby Skippy The Doxie posing with her own Pedigree Goodies! So cute! Unfortunately, it is only available for Metro Manila addresses. If you have a relative living in Metro Manila, you can input their name and address so that it will get delivered. I have not yet received my free samples. Is there any number to contact so that I can ask or followup? Thank you. may i know how to avail pedigree sample? How can I avail free food for puppies? Always the website maximum number of registration huhuhu pls help for my puppies. please, I signed up for a sample,but in the address, i got the bayan name wrong, and I havent received the package yet. can i edit it in case they cant deliver it because of the wrong bayan? May nakita po akong nagpost ng maraming sets ng pet degree sa isang Dog Lover Philippines FB Group. Isang owner lang din ang may ari.may nagpost tungkol don sa babae na andaming free sample ng pet degree na halos siya na ata nakaubos. Andaming nagalit sa nakakita sakanya.Bakit ganun ang sabi 1set per 1household lang. Pero siya ata nakakuha ng buong free sample ng pet degree dapat chinecheck niyo po kung ilan natatanggap nila kawawa naman yung iba na di nakakaavail para sa baby dogs nila.. nagtry ako ngayon wala ng stock..
Heya! Just wondering if you know a supplier within qc, caloocan or valenzuela who sells cheaper pedigree df. TIA!